If you're working on a new build construction, whether for commercial or residential purposes, it's an essential requirement of Building Regulations that SAP calculations and EPC certificates are provided. The purpose of these requirements is to ensure that new build properties are as energy efficient as possible. At Falcon Energy, our team are fully qualified experts in energy conservation and have extensive experience offering help to new build projects. This includes SAP Calculations and Energy Performance Certificates across Sussex, Surrey, Kent, London and the UK. SAP Calculations (Standard Assessment Procedure) are a key component of any new build project and are used to establish carbon emissions and the subsequent energy costs of the property. These emissions are linked to ventilation, light, heat and hot water and the calculations need to be submitted within 30 days of the completion of the building. When planning your development, SAPs ideally need to be considered at the design stage or at the very least, the beginning of a build. Once a development has started, it becomes increasingly difficult to make a difference to the energy performance of a property. SAP Calculations are a requirement of the Building Regulations in the UK and can be a challenging aspect to a new build, especially if you're new to such construction. Buildings are rated between 1 and 100; the higher the number the more energy efficient the property is and the lower the energy costs will be. All dwellings need to gain a ‘pass’ in order for them to be viable for sale. 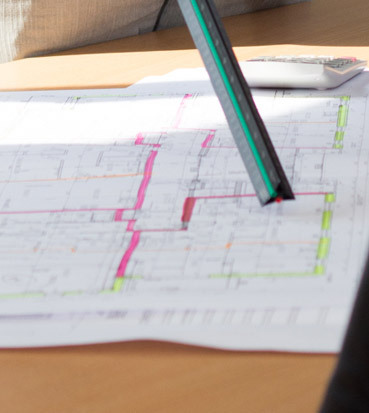 Whether you're building a property from scratch, are converting or extending a current build, SAP Calculations cannot be overlooked and need to be undertaken by a professional, accredited company. Whether your build is commercial or domestic, large or small, we have a wealth of experience and a highly qualified team of professionals who, in line with Part L of the Building Regulations, will ensure your new build project conforms. No site visit is necessary and all calculations can be made based on the specifications from the above documents. Not only will we complete all of your calculations for you in a timely and professional manner, we'll also suggest innovative materials to make your property more energy efficient and can offer advice on renewable energy sources to make your project more eco-friendly. At Falcon Energy we pride ourselves not just on our expert team but our efficient, friendly and transparent customer service; so whether you're an experienced new build constructor or are new to the field, we can offer the help and guidance you're after. If you're about to embark on a new build, extension or conversion and would like help and advice on SAP Calculations, call us on 01403 253439. You can also email info@falconenergy.co.uk or complete our contact form. SAP or “Standard Assessment Procedure” is a Government approved procedure used to provide an energy rating for domestic properties. It results in energy certification and a rating between 1 and 100. The higher the rating, the more energy efficient a dwelling, and with renewable energy it is possible to exceed a 100 rating. When is a SAP calculation required? Under current Building Regulations, a SAP calculation should be carried out when new residential properties and developments are constructed, and when existing homes are converted or extended. SAP calculations are presented in the survey for homeowners when buying a property. To a degree, it is possible for results to affect the appeal of a property when selling. How do you calculate the energy rating? Before the property is completed, assessors calculate the Target Carbon Dioxide Emission Rate (TER) of the property. This rate details how much CO2 it is permitted to emit, and is a minimum standard for its energy performance. The next stage is using the actual design of the property to calculate the DER or Design Carbon Dioxide Emission Rate. In all instances, the DER should be lower than the TER so it can be approved within the predetermined environmental limits. After construction a final calculation is made; the ‘As Built DER’. This assessment ensures the property has an acceptable level of CO2 emissions. When should I have the assessment done? The test should be carried out before the property is being constructed, as it may identify that the plans aren’t adequate and need to be changed to pass Regulation 26 of the Building Regulations. Once construction has started, it is considerably more expensive to amend the design. We carry out our SAP and EPC tests before construction to give you flexibility in materials and costs and to ensure you have the best advice and information going into the project. An EPC is an Energy Performance Certificate (EPC) which is given to potential buyers or renters of a particular property. The EPC report covers the energy efficiency of heating and lighting and shows the estimated CO2 emissions. For potential buyers, it shows them how much they may spend on energy bills, how much energy waste the property potentially has and whether the rating can be improved. Each EPC gives a property a rating from A to G; A is the most efficient rating and G the least efficient and would be more common in older properties. An EPC is the industry standard in building and is defined clearly by legislation. All new build properties need an EPC in their pack for potential buyers. They are also required if a property is changing its purpose, such as a commercial property becoming domestic, as well as any residential property built from 6th April 2008. With new build properties, the EPC’s can only be conducted by On Construction Domestic Energy Assessors (OCDEA’s). This is part of an accredited Government approved scheme. An OCDEA is an authorised On Construction Domestic Energy Assessor (OCDEA) who can test and create a verified EPC for inclusion in Home Information Packs for new build, domestic properties. Since April 2008, this has been a requirement for all new build domestic dwellings and tells new homeowners how energy efficient their new property is. All new properties should take environment and energy performance into consideration when being built and upgraded. What other certificates are involved? A Predicted Energy Assessment is produced before a property has been built and is a certificate produced alongside the Design Final SAP calculation. This is required for properties being sold off plan before the final EPC has been created for the buyers. It will then be replaced with the EPC when available. Again, the PEA can only be completed by OCDEA’s.